Sometimes God gives us signs to show us the way. If you believe in them and really want to know God’s will for you, you might be able to see and follow the signs to Jesus’ will for you. Sometimes the sign may just appear—one bright star in a sky filled with twinkling stars. Are you watching for the star? Will you notice? At other times, God’s sign to you might be big and dramatic. It might even be frightening—like an army of angels singing to the shepherds on a cold Bethlehem night. It that case, the challenge may be—not so much noticing the sign, but—deciding what to do with it. What will you do when God sends a sign so big it stops you in your tracks and shakes you to your very core? The shepherds could have run away and hid in fear. They might have been frozen with fear and done nothing. But instead, their fear turned into a blessing because they obeyed and went to Bethlehem and found Jesus. Night time can be an eerie occasion. It probably was for the shepherds. I remember a cold, dark and eerie night when God gave me a big (and frightening) sign. I was only 18-years-old. I was driving from my mom's home in Macon back to college in Marietta. Now I don't know about you, but when I have a long drive like that by myself, I like to turn up the radio. And since I'd driven that route so many times, I wasn't paying much attention to where I was. Then, my '84 Mercury decided to die. Smoke billowed from beneath the hood. The car decelerated and I pulled off to the shoulder. The car shut off and would not start. I found myself on the side of I-75 at 11:00 PM on a Sunday night somewhere between Macon and Atlanta and I had no idea where. This was before cell phones so I needed to walk to a gas station to find a payphone. The problem was, I didn't even know if I needed to walk forwards or backwards! I chose to go forward. As I walked forward in the dead of night, cars speeding by at 65, 75, 85 MPH, it dawned on me--for the first time in my life--this could be my last night on earth. All it would take was one of those speeding cars to swerve slightly off the road and hit me. I'd heard of things like that happening before. Or maybe, some serial killer decided to pull over and abduct me and cut me up into little pieces just for fun. I'd heard of things like that happening before too. I realized that night that I was not ready to die. "Why not?" I thought. "I'm a Christian. I gave my life to Christ. I will go to heaven when I die. What's keeping me from being ready?" Yet I still felt I was not ready to die. Something was left unfulfilled in my life. I realized I walked that lonely dark road I was not walking the road God wanted me to walk in life. And that dark road became a frightening sign to me that I needed to do some things different. I needed to change the direction of my life so I would be ready when my time came. God's sign to me helped change the course of my life. I have heard of dramatic signs in other people's lives too. When I was in seminary, I volunteered as a chaplain for The Carpenter’s House, a drug and alcohol rehabilitation center. I heard several recovering addicts share how their addiction landed them in the hospital or nearly ended their lives. They realized they had to change or else their addiction would kill them. God must have saved their life for a reason so they better get busy finding help to overcome their disease. I have seen others signs too. I had a church member once who had a heart attack. He realized he needed needed to be there for his daughter as she grew into a young adult, found a mate, and got married. He started walking and exercising and eating healthier. His heart attack was a sign. Perhaps you lost your job. It was hard--not only because of the money, but--because your job was an important part of your identity. Maybe God is trying to tell you your job is not your identity; find your identity in Christ. Maybe God is telling you to trust money less and trust God more. Maybe someone you love dies unexpectedly. That can be a sign from God. One of my former church members died this past weekend--Jim Ham. Jim was a father grandfather county commissioner, and he was only 54 years old. He died in a single car crash. No one saw it coming. Unexpected deaths like this can be a tragic sign that reminds us to cherish those you hold dear. They jar us out of our complacency and teach us to take full advantage of the present moment for we never know how much time we have; nothing is guaranteed. What if someone you love looses faith? When my brother came home one Christmas many years ago saying he no longer believed what he'd learned about Jesus in church, our family was very concerned. Furthermore, Nelson seemed to know so much more about the Christian religion and what the Bible says than I did. This was a big sign to me that I needed to make the effort to know what I believed and figure out if I was just taking for granted the things people had told me about Christianity over the years. Perhaps when someone you care about has doubts about their faith, it is a sign to you to take your beliefs and how you live more seriously. Maybe it's time to get serious about your own faith and GRO a little. If you want to get serious and grow in your faith, you need to G.R.O. Growth can only come when you are committed to growth. I hope you will commit to personal growth throughout your life. True Christianity doesn’t mean we get saved and then hide in a corner for the rest of life. We are constantly growing to become more like Christ. Growth should occur in all areas of our life--spiritually, intellectually, and physically. These areas are all interrelated and you cannot be truly healthy in one area if you are lacking in the others. Respond. In order to grow, you have to respond to the Holy Spirit. You are responsible for your growth. that doesn't mean you make yourself grow. The Holy Spirit makes you grow. However, when the Holy Spirit guide you to do something, you are able to respond by doing it. So you must respond because you are responsible. Obey. You grow when you are obedient. You can't expect to grow if you disobey the Holy Spirit. But if you respnd with obedience you will grow. If the Holy Spirit guides you to study your Bible, you will grow spiritually. If the Spirit tell you to exercise and you obey, you will improve your health. But if you disregard or disobey, you will not grow. Are You Ready to GRO? Sometimes God gives us a really big sign to shake us to the core. If God has done that for you, I hope you will Grow by Responding with Obedience to what the Holy Spirit has said. Perhaps God's sign to you was more subtle, but if you're paying attention, you can still see the sign like the star shining for the Wisemen. Let God get your attention and ask Him to reveal what he wants you to do. Next week we will discuss how you can interpret the meaning of Gods signs. Holy Communion (AKA The Lord's Supper or the Eucharist) is a tremendous sign of God's love and presence with us. The bread represents the body of Christ God gave us. The wine represents the blood Christ shed for us on the cross to forgive our sins. This simple meal reminds us of Christ's loving sacrifice for us and also his living presence with us today. 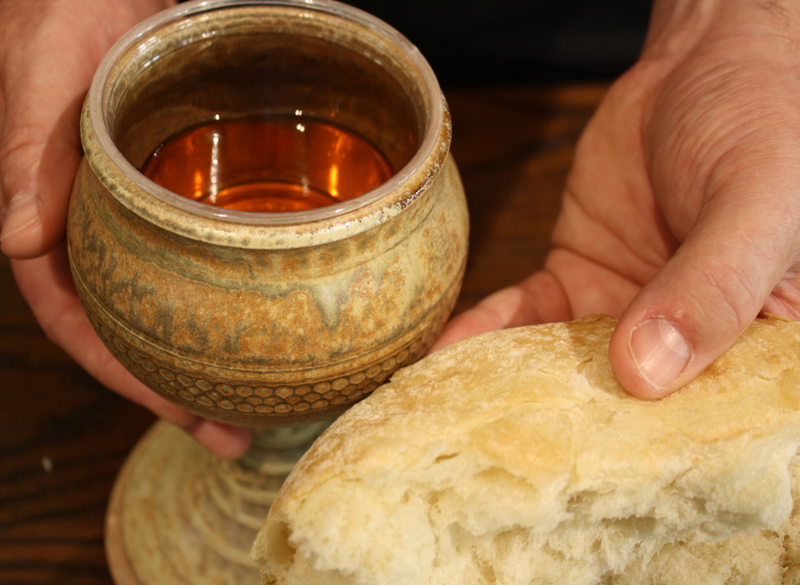 When have you last received Holy Communion? Do you see God's sign to you in this sacrament?